Vivo V7+ Launched - Features A 24 Megapixel Selfie Camera! The main highlights are the 24MP selfie camera and premium build. Chinese smartphone maker Vivo’s newest handset: V7+ was launched by Bollywood actor and Brand ambassador of Vivo, Ranveer Singh. The highlight of this sleek new smartphone is the 24 mega pixel front Camera, which has been described as ‘revolutionary’ by the brand. 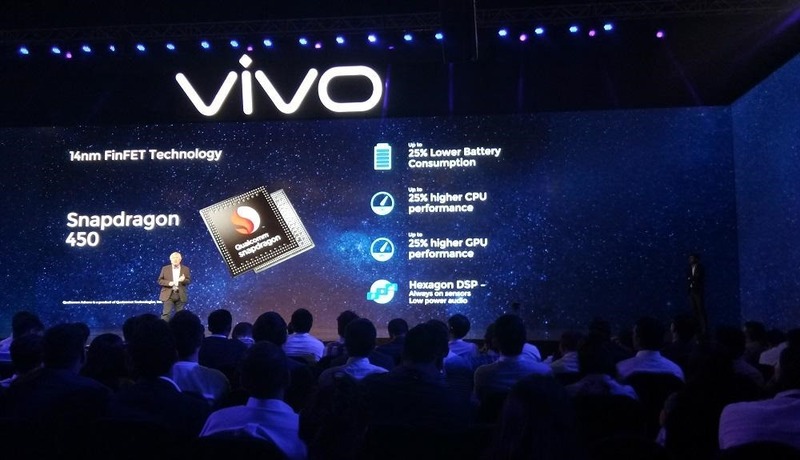 Vivo, whose punchline for selling smartphones have been “Camera & Music” since the start, has once again focussed on these two aspects with rigorous precision. And, as the festive season is round the corner, this strategy seems apt as well. During the launch, Vivo India’s Brand Head Nipun Marya informed the audience that with 80,000 offline stores and 18% market share, they are selling 1 million units a month. Their focus is Make In India, as they were among the first Chinese smartphone manufacturers to set up their own manufacturing unit in India. In their product, especially in their new, improved camera, they have included features which will identify ‘Tilak’, ‘Bindi’ and ‘Sindoor’ applied by Indian women and the algorithm will recognize them, instead of removing them as spots. The handset is priced at Rs 21,990. Pre-bookings will start from September 7th and handsets would start shipping from September 15th. As per available information, pre-bookings can be done on Amazon, Flipkart or offline store.